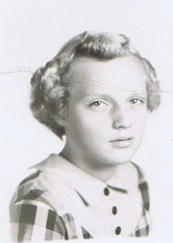 Today I’m sharing with you a recipe that my mother’s cousin, Peggy Cerva, recently sent me. 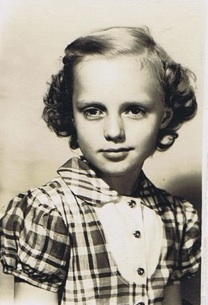 I can tell that Peggy and I are related, because we both seem to have trouble smiling while getting our picture taken! 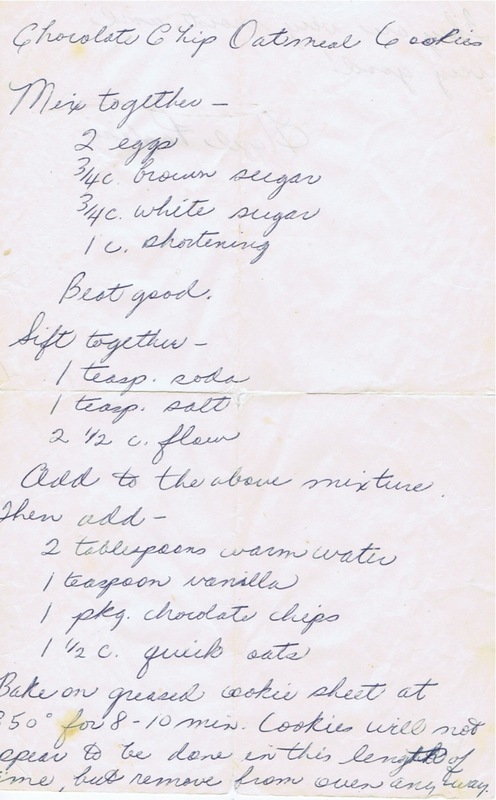 Peggy says that Hazel sent her this recipe — it’s in Hazel’s own handwriting. She thought I might like to have it. Of course I would!! It arrived in the mail earlier this week, and I tried it out right away. I didn’t change a thing, and they came out really good! So now I’m sharing it with all of you. Here’s Hazel’s original recipe — Peggy says she’s had this piece of paper for “40 some years”, so it’s a little beat up, but oh, so precious! Add to the above mixture. Bake on greased cookie sheet at 350 degrees for 8-10 minutes. Cookies will not appear to be done in this length of time, but remove from oven anyway. Peggy says chocolate chips used to come in 6-ounce bags, whereas nowadays they’re usually 12 ounces. So just use what you want. Peggy says she uses more than 6 ounces, and hey! it’s chocolate, so I did, too! She’s right — they are! Enjoy!